Media continues to report on a heightened level of violence in London over the past few weeks. This follows reports over the weekend that the murder rate in the capital has now overtaken New York. On Monday, 17-year-old Tanesha Melbourne-Blake and an un-named 16-year-old boy were shot in separate incidents. Ms Melbourne-Blake died on Monday morning and the death of the 16-year-old was confirmed last night. There is blanket coverage in the papers and widespread reporting on broadcast media of the incidents, focusing mainly on the death of Ms Melbourne–Blake, who is claimed to be an innocent bystander. The Times and Telegraph report that the Home Secretary will outline stricter measures on gangs using social media to restrict the sharing of images and videos used by violent groups. The Telegraph says the Serious Violence Strategy will force social media platforms to remove content. Analysis in the Times says that the strategy should acknowledge that young people carry weapons for a “misguided perception” of protection and that more young people are being driven into county lines. Other papers note that the strategy is due to be published soon. 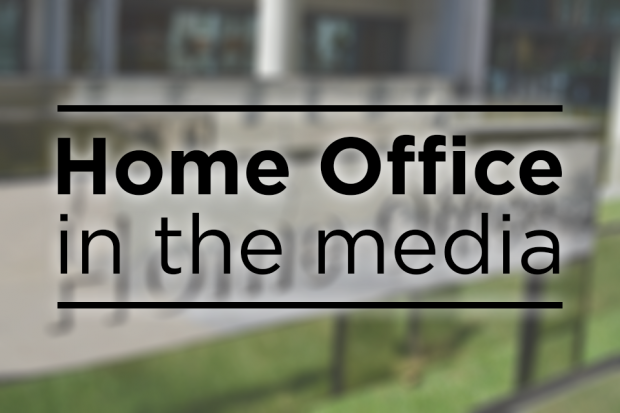 The Home Office and Downing Street statements are widely carried. The newspapers’ leaders are mainly critical of authorities’ reaction to serious crime. The Times says that the Government should enforce a serious “zero tolerance” approach rather than being “tepid” on the issue. It says that various Home Secretaries have “talked tough” but most people caught with a knife get away with a caution. The paper does note that Britain is mostly still a peaceful place compared to other countries. The Mail and Express leaders also call for a zero tolerance approach like New York with the Express also saying there needs to be more police on the streets. The Mirror says reducing police numbers were “dangerous austerity cuts” while the Sun claims that the focus must be on the next director of public prosecutions focusing on justice to keep the streets safe. As the Met Commissioner has said, gangs often post videos online that seek to incite violence or glamorise criminality to influence young people. The instant nature of social media also means that plans develop rapidly and disputes can escalate very quickly. The Government, voluntary sector and other partners are working with social media companies to ensure measures deliver real results and raise the level of online safety for users. We are clear that internet companies must go further and faster to tackle illegal content online. It is already an offence to incite, assist or encourage violence online and we will continue to support proactive operational police action to tackle offences perpetrated online. Our new Serious Violence Strategy, which will published soon, will also put a stronger focus on steering young people away from violence whilst continuing to ensure the strongest possible law enforcement response. It will examine how social media usage can drive violent crime and focus on building on the progress and relationships made with social media providers and the police to identify where we can take further, preventative action relevant to tackling serious violence. The Times, Telegraph, Independent, Guardian, Financial Times, Mail, Sun, Metro and City A.M report on the gender pay gap ahead of today’s deadline for larger businesses being required to disclose the average pay between their male and female workers. The papers note that of the 9,000 larger businesses and public sector bodies required to disclose this information, 8,330 had done so last night, with more than three quarters reporting a bias towards men. The papers note the median gap in pay per hour is 18 per cent, but name some companies for example RyanAir, who revealed a figure of more than 50 per cent. In an article today for the Telegraph, the Prime Minister admits that the gender pay figures make “uncomfortable reading” for many businesses as she compares today’s battle for workplace equality to the struggle for universal suffrage a century ago. Baroness Williams was interviewed on BBC Breakfast, BBC Radio 5Live and the Today programme all noted the Prime Minister’s promise to tackle the “burning injustice” of the UK’s gender pay gap. They noted that 78 per cent of companies who have reported so far pay men more than women, 13 per cent pay women more than men and 8 per cent report no pay gap at all. There is absolutely no excuse for businesses in the private sector not to be transparent about their gender pay gap before the deadline set down in law – particularly after the public sector showed such a strong reporting performance. Businesses should see reporting gender pay gap data as just the first step on the road to creating fairer and more equal workplaces across the UK. They should be putting action plans in place to break down the barriers to women’s progression in their organisations. Closing the gender pay gap also makes economic sense. Research shows that improving women’s participation in the labour market could add £150 billion to the economy by 2025. That’s a number we cannot afford to ignore.